Pakistan Tehrik-e-Insaf (PTI) had heavily criticized the Pakistan Muslim League Nawaz (PML-N) government for wasting taxpayers’ money on image building and to please self-proclaimed godfathers in media. PTI, when swung into power, decided not to take the path their predecessors chose; they cut down the cash flow to the media houses in the name of advertisements. In return, almost all the news channel began propaganda against the government and a flood of fake news engulfed the media. However, the supporters of PTI were actively refuting all the fake news, standing by the government in crucial times. Seemingly, the government couldn’t bear any more pressure from the media and decided to give in to media mafia’s demands, applying the old and tested tactics of the PML-N government. Following the completion of the first 100 days, PTI recklessly spent millions on ads that were never required. Take a look at the images below and decide for yourself if the following advertisements were worth your hard-earned money! Promises were made by someone who had no experience in handling an government organization. As soon as they were in the mud they got to know the reality and were severely bogged down. Their ambitions were flamed out and the only way for face saving was propaganda. A bitter truth summarized in few lines. Completely agree with you. Its a SC decision to remove leader’s pics from govt sponsored ads. Earlier, you were making a lame excuse that you did not know whether govt funds were used for these ads. Once silenced, you have opened another ridiculous pandora box – just like other parties would do in their regime. You are adamantly pretentious. I am glad that unlike other parties, a majority of PTI voters hold their govt very much accountable and correctly so. 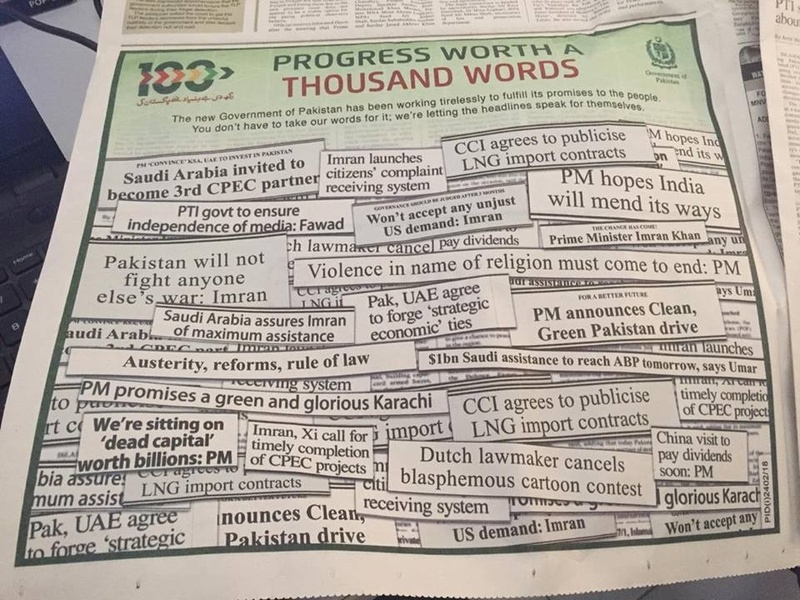 Cost of the Advertisement in newspaper is not based on picture, its the space occupied by the add even if you write one word, so this is simply wastage of Taxpayers’ Money and nothing else. i fail to see any relevant content in this post! Seems like Raza Rizvi is trying to draw a comparison between the ads of previous govts. and the current one…which clearly is misleading,,,i think he’s confused and doesnt get wat the criticism was against the previous govts…i’ll try to explain for you Raza… the issue was never about Govt. giving ads, it was mainly the leaderships using that space to promote themselves with their pictures and party logos blatantly & shamlessly posted on each ad. I dont see either of the 2 on this advert!! 2ndly – do u have any sort of proof of Taxpayer money being used for this ad campaign? maybe PTI paid for the campaign from it’s party fund!? please show proof if you have any!! Thank you for explaining in simple English. These bigots and PML N stooges never understand the real problem. They are blind and they will remain blind until the day their judgement comes in. Actually, this goes aptly for the voters of all parties including PTI cult followers. Gullible dumboos indeed fail to understand the real scam. The ads are paid-for by taxpayer money and this is a series of ads that would last next few days. And there are no pics in ads coz SC banned that, my dear forgetful old country men. Will we ever stop being a chay? I must wonder. PTI cult followers? Every party has cult following here in Pakistan. So dont try to count yourself out of it. You might be following PML N or PPP or worst yet JUI-F blindly. However, before criticising the current Govt., compare their performance with the previous ones. However, I suspect my words are falling on deaf ears. So yea do whatever you want to do and support whoever you want to support. PTI performance, in unbiased manner, is way better than the previous ones. From where “party fund” are collected, is it Zakat or money growing on trees? on other hand Pakistan ka phala sarkari advertisement jis main sarkar ki koi photo nhi hai…. I dont think so, as they do not advertise daily and they did so today as it was main event for public.